Our banking professionals are the best at what they do, giving you the expertise you depend on and the personal care you need. Big Enough to Know Business. Small Enough to Know You. First Independent Bank provides personal care for each customer while having the expertise and resources of a large bank. With broad experience and the ability to work with more types of financing solutions than many competitors, First Independent Bank is a collaborative group of advocates for businesses and families in Minnesota. We care about our community, and that's why we do what we do. First Independent Bank exists to be a thriving independent community bank by building mutually beneficial relationships with our customers, employees, and local communities. Big Enough to Know Business. 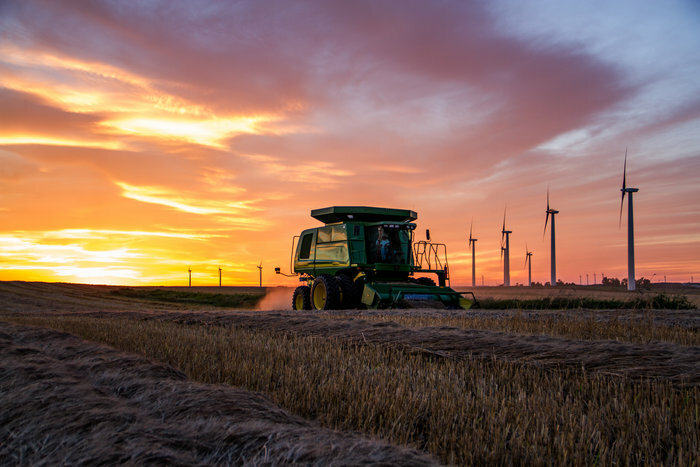 With the expertise and resources of a large bank, and with over 100 years of banking leadership, First Independent Bank advocates for businesses and farming operations of all sizes. We make financial solutions available that will keep farms and businesses healthy and growing. We are your neighbors and friends, looking out for you and your interests as we provide access to the banking services and solutions that you need. Whether you are looking for personal banking services that will advocate for you or for a bank that can handle the high demands of a growing farm or business, First Independent Bank is here for you. The Bank was reorganized in 1902, but January of 1903 was when it actually became incorporated, marking the official beginning of the present Bank, which was called First State Bank of Russell. The Bank was built of brick in 1904. In 1921, there was a disastrous fire on Main Street; the Bank only suffered water damage because of the brick structure as the flames spread throughout the wooden structures along the street. In 1923, the First State Bank purchased the Farmers State Bank and moved into the new brick building because it was better equipped to handle the increase in business. It was named Farmers and Merchants State Bank, with Harry Tillmans of Minneota as President. Like so many banks throughout the country, at the height (or depth) of the Big Depression, the Russell Bank closed their doors the fall of 1930 and remained closed until March 23, 1931. When it reopened in 1931, William Palmer was President. On January 3, 1933, three masked gunmen robbed the Bank. One man was armed with an automatic weapon, one stood at the door with a machine gun, while the third remained in the car. No one was hurt in the robbery and the men were never captured. Russell nearly lost its Bank again in 1934, when stockholders voted to move it to Marshall. Fortunately for the town, the Commissioner of Banks would not allow the move. Over the next several years, the Bank changed hands several times and on February 1, 1947, the name was changed to Farmers State Bank. Jim Ulvilden came to the Bank in 1953 as Ag representative and later bought the Bank. Upon Jim’s death, his wife, Irene sold the Bank to Tom Rustand. In 1982, Tom Rustand sold the Bank to the current owners with Duke Pogatchnik as President and his father, Lowell Pogatchnik as Chairman of the Board. In 1983, the new owners made plans for an expansion and remodeling project, giving Russell the finest, most modern and up to date banking facility in Southwestern Minnesota at that time. In December of 1994, Farmers State Bank of Russell changed its company name to First Independent Bank. Not long after the name change, the Bank opened a branch in Marshall in January of 1995 as an added way to serve our customers. Many customers employed in Marshall had little opportunity to use the Russell office. Placing an office in Marshall satisfied many of the customer's needs. In April 1999, the First Independent Bank purchased the former 21st Century Bank in Balaton. By purchasing the Balaton location, we not only increased our customer base, but we were able to offer our present customers yet another location to do their banking. In 1999, there was much talk about the Y2K compliance issues. After much preparation, First Independent Bank breezed through the big Y2K scare with no incidents. On September 27, 2000, the First Independent Bank’s Russell Office was robbed for a second time in its history. The robber walked up to one of the teller windows, claimed to have a gun, and asked for her money. The robber then walked out of the Bank with the cash without incident. Again no one was hurt and eventually the robber was found and arrested. On December 5, 2001, United Prairie Bank – Slayton entered into an agreement to sell the assets and liabilities of its Marshall Branch office to First Independent Bank. This move allowed the existing Marshall Branch office to move from their facility, which they were outgrowing, into a bigger facility. In 2003, First Independent Bank celebrated their 100th Anniversary, serving Russell and the surrounding areas. To recognize 100 years of First Independent Bank’s success, and to show appreciation for their customers that got them there, they held a celebration that included the re-enactment of the 1933 bank robbery, a performance by the “Great Pretenders”, a picnic and much more. We hope to spend the next 100 years improving and providing our customers with even better quality and wider variety of services. In the fall of 2004, the Board of Directors at First Independent Bank were approached about opening an in-store branch at the new Super Walmart store in Marshall. Though in unfamiliar territory, the Bank embraced the opportunity and opened the location on April 13, 2005. Opening the Walmart branch provides another convenient location for our customers and has brought great success to First Independent Bank. In 2005, the Bank constructed a new bank building for the Balaton office. This building features a drive-up, a 24 hour ATM and additional offices. Due to the growth of the Bank, the Russell Office updated their building with a new addition to house a new and updated operations center, a much needed storeroom, conference room and three additional offices. In October of 2011, First Independent Bank was presented with the opportunity to purchase the State Bank of Lucan. On December 30, 2011, the merger was completed and Lucan added $40 million in assets and offered yet another location for our growing customer base. In March of 2013, two more offices were added to First Independent Bank with the purchase of Beardsley Bancshares, Inc. The Ruthton office was incorporated in 1917 as First Farmers & Merchants Bank with a name change to Buffalo Ridge State Bank in 1977 before being acquired by Beardsley Bancshares, Inc. in 1984. Our nine area Banks make up half of the family Bank partnership that Duke Pogatchnik operates with his brother, Bruce Pogatchnik. The northern Minnesota side of the business includes a chartered Bank in Finlayson with locations in nearby Willow River, Barnum, Cromwell, Deer River, Floodwood, Grand Rapids, Sandstone, Askov, Kerrick, Hinkley and Park Rapids. First Independent Bank provides personal care for each customer while having the expertise and resources of a large bank. With broad experience and the ability to work with more types of financing solutions than many competitors, First Independent Bank is a collaborative, relational group of advocates for businesses and families in southwestern Minnesota.